Surgical training has undergone major changes in the past decade, both internationally and in South Africa.1 These changes are the result of various factors which include trainee work hour restrictions (intended to mitigate trainee fatigue and improve patient safety),1 the proliferation of minimally invasive surgery,2 development of surgical subspecialties, involvement of other specialties in the definitive care of surgical patients, changes in population disease profiles and funding priorities directing surgical pathology away from academic training centers.3 In South Africa, the now mandatory completion of a research component of specialist training is another factor contributing to change. This issue was the first sphere of registrar training examined by SASSiT, with results disseminated by Patel et al. in their article 'South African general surgical registrars perceptions of the research component of training: Hope for the Future?4 In the United States the changing landscape of surgical training prompted the 2004 American Surgical Association Blue Ribbon Committee Report on Surgical Education. This report emphasised the need for surgical training to be tailored to the needs of specific disease profiles and to incorporate new technologies in order to compensate for the decreased patient exposure encountered in the training of the modern surgeon.5 Surgical training varies significantly amongst universities within the same country. This trend is reflected in South Africa and provides an opportunity for innovation to improve the quality of general surgical training. A survey of general surgical residents in the United States revealed that nearly 40% of new graduates lack confidence in their surgical skills.5,6 The same survey found that up to 80% of the surgical graduates elect to undertake post graduate fellowships in order to gain the confidence, maturity and clinical acumen required for independent practice.5,6 In South Africa, a 2014 study found that newly qualified specialists felt that there was insufficient exposure to the latest surgical techniques during their training, particularly in the field of minimal invasive surgery (MIS).7 Furthermore, a 2014 study by Kruger et al. demonstrated that 61% of all procedures performed by surgical trainees in South Africa during the course of their training were unsupervised.8 The immediate enrolment of newly qualified trainees into fellowship programs is detrimental in low and middle income countries with significant shortages of general surgeons, high patient volumes and a wide variety of surgical pathology. Given the paucity of literature on surgical training in the local setting and within the current context of local and international challenges to surgical training, there is an urgent need to review current surgical curricula and training methods. This study aimed to assess the perceptions of general surgery registrars in South Africa regarding the adequacy of their surgical training. A prospective descriptive study was performed by means of a confidential questionnaire. The registrar representative of the South African Society of Surgeons in Training (SASSiT) at each university distributed questionnaires to surgical registrars in each department. The questionnaire was divided into four sections that assessed perceptions on: (i) time dedicated to formal academic teaching, (ii) supervised surgical training within theatre, (iii) exposure to and training in MIS, and (iv) major hindrances to surgical training. Descriptive statistics were generated with Microsoft Ethics. Clearance was obtained from the University of Witwatersrand Human Research Ethics Committee. A total of 200 questionnaires were distributed to surgical registrars at 8 universities in South Africa. All participants provided written consent; participation was voluntary and no participant received material benefit from participation. No identifying data were captured. Of 200 questionnaires distributed, 52.5% (105/200) were returned representing 43.5% (105/241) of all surgical registrars nationally. Respondents spanned six of the eight medical universities in South Africa. 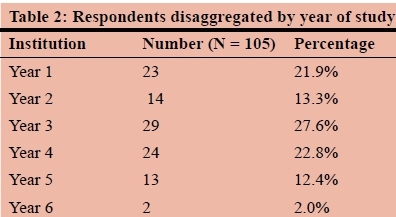 For breakdown of respondents according to institution and year of study see Table 1 and Table 2. 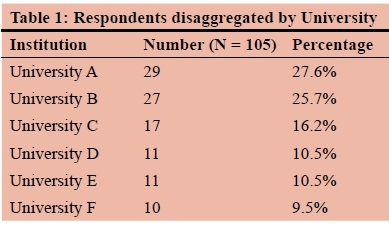 Specific universities are not identified in order to minimise potential for identification of respondents. As presented in Table 3, 71.4% (75/105) of respondents reported that their institution offered less than six hours of formal academic teaching per week and 89.5% (94/105) indicated that they attended less than six hours of academic teaching weekly. 95.2% (99/105) reported that clinical responsibilities prevented them from attending formal academic teaching regularly and 31.4% (33/105) were satisfied with the amount of formal academic teaching offered at their institution. 85.7% (90/105) of respondents reported receiving less than six hours of supervised surgical training per week and only 20.9% (22/105) reported the opportunity to be the primary surgeon in more than half of all elective cases. Only 37.1% (39/105) of registrars reported receiving adequate training in MIS. Further data on registrar perceptions of supervised surgical training are presented in Table 4. Lack of resources and appropriate skills were identified as hindrances to MIS training by 47.6% (50/105) and 28.6% (30/105) of respondents, respectively. 76.2% (80/105) of respondents regarded lack of protected academic time as the greatest hindrance to their surgical training. These data are presented in Table 5. It is concerning that less than one third of registrars (31.4%) are satisfied with the amount of formal academic teaching offered at their institution and that close to 90% attend less than six hours of academic teaching per week. 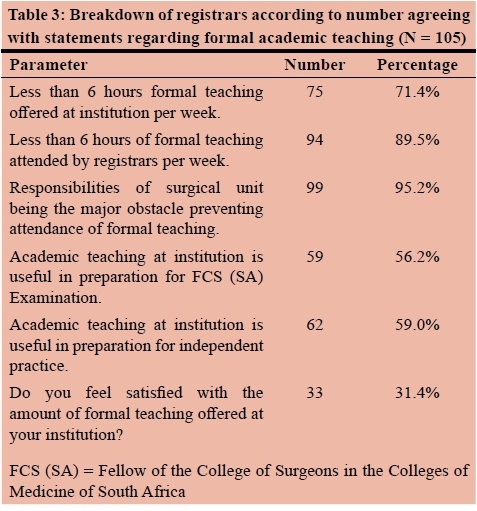 This is despite the fact that the majority of registrars (59%) agree that formal teaching is vital in the preparation of surgical trainees for independent practice. An overwhelming majority (95.2%) of registrars consider clinical responsibilities the main obstacle to participation in academic teaching. Further, 76.2% of registrars identified a lack of protected academic time as a key impediment to surgical training. Emphasis on service delivery over academic commitments is a recurring finding in local studies over the past two decades as reflected in Thomson and Baker13 and Kong et al.1 Due to the large burden of disease and shortage of general surgeons in the public service in South Africa, general surgical trainees are required to compromise on academic activities in the interest of patient care. Addressing the balance between service delivery, protected academic time and trainee fatigue is a challenge for the South African academic surgical community that remains to be adequately addressed. Minimal access surgery is now considered best practice in the management of a range of surgical pathologies. As demonstrated in certain centers in South Africa, the adoption and growth of MIS is possible within the public health sector.17 MIS is well established and even flourishing within certain public training centres. This demonstrates that so called 'technologically advanced' surgery need not be the domain of the private sector in South Africa. This said, less than half of surgical trainees (37.1%) are currently satisfied with their training in MIS. Adequate training in MIS necessitates exposure to techniques of laparoscopy and ongoing exposure and supervised practice.17 This may be facilitated through surgical skills laboratories, surgical simulators,17 web based expert tutorials,18 and laparoscopy courses. Lack of resources (47.6%) and lack of necessary skills (28.6%) were identified as the greatest obstacles to training in MIS. These findings are similar to those of De Beer et al.7 and Apostolou et al.17 who also identified lack of resources as the main impediment to laparoscopy in the South African public health sector. Further, they concluded that training in laparoscopy in South Africa was sub-optimal17 and required a concerted effort from the surgical fraternity and public health administrators to address. We acknowledge that this study was limited by the low sample size, the fact that results were not reported by institution (to minimise the potential for real or imagined repercussions for respondents) and that only 6 of 8 training centers in the country were sampled. This said, we believe this study highlights important trends inhibiting surgical training in South Africa. General surgical registrars are concerned with the current training programme which they perceive to be confronted by three main challenges. These are lack of protected academic time, inadequate senior supervision in theatre and insufficient exposure to MIS. There is doubt amongst registrars that the level of training currently received is adequate to impart sufficient skills and acumen to practice independently upon qualification. South Africa has a long tradition of training skilled surgeons.10 The challenges presented above necessitate a review of surgical training in order to maintain this proud tradition. On the basis of our findings and given that the immediate enrolment of newly qualified specialists in fellowship programmes in low and middle income countries (such as South Africa) with small specialist pools and high surgical needs may be detrimental to the surgical needs of these countries, we suggest that the current model for general surgical training be reviewed. We propose greater monitoring of the academic and service delivery responsibilities of consultants employed in the public and private sectors. We also suggest mentorship programmes for junior specialists, as utilised by the American College of Surgeons,18 with the objective of reinvigorating the role of general surgery consultants within the public sector. Additionally, we propose the mandatory completion of courses in MIS as a prerequisite for qualification and the creation of opportunity for registrars to rotate through well-established local MIS centers. Discrepant access to the private sector through university affiliated academic surgical departments may be addressed by offering those universities without access to private academic centres the opportunity to formally rotate their trainees through those that do. Finally, we propose the institution and enforcement of minimum provision and attendance requirements on academic activities for general surgery trainees. The authors would like to thank Dr. Tumi Mabogoane, Dr. Siddharth R Gautam, Dr. Chun-Yen Wu and Dr Megan Peffer for their contribution.